Cadets from Reserved officer training corps (ROTC) visited Nepalese Army Institute of Health Sciences (NAIHS) in the month of June, 2016. Cadets visited in three groups. Group 1 visited NAIHS under command of LTC Joe Evans on 1st June, 2016. Group 2 and Group 3 visited on 7th and 14th June 2016 respectively. They were received by Executive Director Major Gen (Retd.) Prof Dr Prakash Raj Pande, Deputy Executive Director Brig Gen (Retd.) 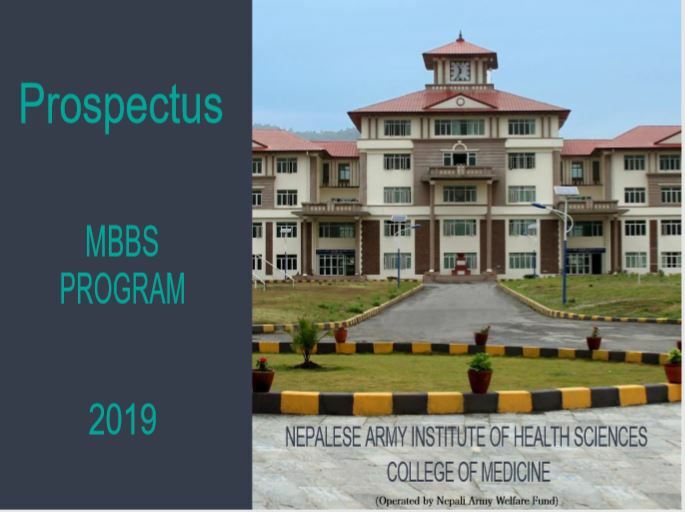 Prof Dr Bhairab Kumar Hamal, Brig Gen Prof Dr Narbada Thapa (Principal, College of Nursing, NAIHS), Brig Gen Prof Dr Brajendra Srivastav (Principal, College of Medicine, NAIHS), Col Dr. Suda Sen Malla (Principal, College of Medical Polytechnic) and other administrative staffs of NAIHS. An overview of NAIHS was briefed to the visiting groups by Executive Director on 1st June and Deputy Executive director on 7th and 14th June. Cadets were impressed by the progress and the academic achievements of NAIHS in such short period of its establishment. They were pleased to have interactions after the briefing and were primarily concerned about the admission procedure, fee structure of MBBS program and status of foreign student’s enrollment in NAIHS. The Cadets took a tour of Basic Science Complex, College of Nursing and Rehabilitation centre in liaison with Capt Dr Anjan Khadka. Cadets enjoyed the location of NAIHS in natural vicinity. They were concerned on the aftermath of earthquake in infrastructure of NAIHS. They were excited to visit Dissection Hall of Department of Anatomy and were keen on enquiring about the cadavers. They were impressed by the facility of various departmental laboratories and museums of College of Medicine, and were pleased to visit skill lab and community nursing lab of College of Nursing.The visit concluded with positive note on continuing such visits bilaterally in future.